Urban design occurs across all parts of a city, from the inner city to the suburbs and outer metropolitan fringe. Urban design is relevant to developments, whatever their nature and size. City-wide transport and infrastructure networks, urban infill projects, regional towns, new suburban developments, shopping malls, streets, office blocks, university campuses and hospitals are all the result of urban design. High quality urban design becomes even more important as we increase the density of our cities and cater for a growing and changing population. It requires excellent planning, design and management of our built environment and the supporting social and economic infrastructure. Creating Places for People—an urban design protocol for Australian cities (the Protocol) establishes twelve broadly agreed principles for quality urban places in the Australian context. These principles can be applied to any project or location—whether it is in a large capital city, regional centre or rural town. WHO IS THE URBAN DESIGN PROTOCOL FOR? Consultants and practitioners whose work has an impact on urban design, including planning, development, architecture, landscape architecture, engineering, economics, law and finance. This audience should make particular reference to the ‘model processes’ for creating high quality urban environments, and the outcomes that these processes are seeking to achieve. The general public (individuals and community groups) who have an interest in urban design, or who may be affected by decisions about the built environment. This audience should refer to the outcomes—that is, the aims and principles—described in this document and how this might affect them. The National Urban Policy was the Australian Government’s strategic policy framework for the eighteen major cities of Australia. It articulates the role of the Australian Government in helping our cities work better, whether through direct investment or in partnership with key stakeholders. One of the actions arising from the National Urban Policy was a commitment to develop an urban design protocol. 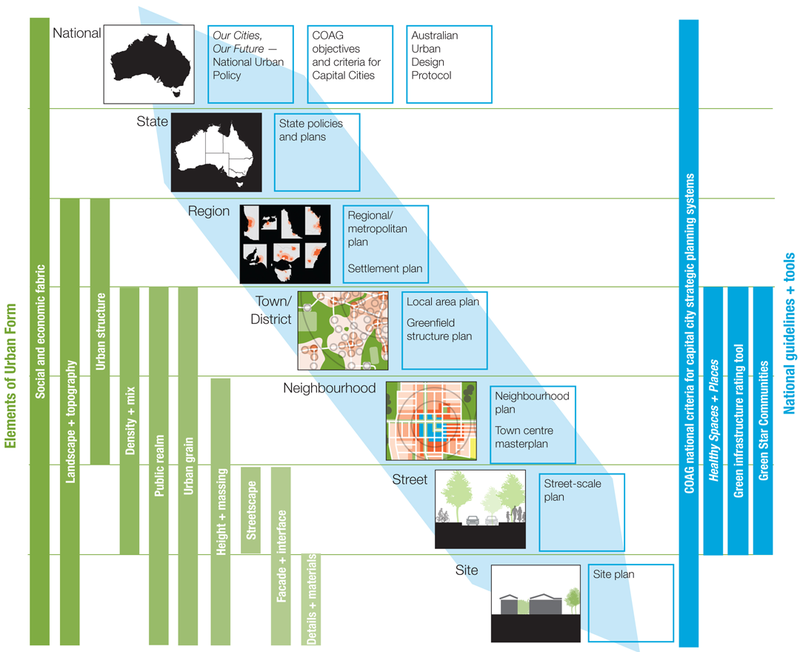 The purpose of the Urban Design Protocol is to encourage world-class urban design in Australia. The Council of Australian Governments agreed to undertake reforms in capital city strategic planning systems ‘to ensure Australian cities are globally competitive, productive, sustainable, liveable and socially inclusive and are well placed to meet future challenges and growth’ (COAG 2009). There are nine criteria listed in the COAG agreement. Among these is: ‘To encourage world-class urban design and architecture’. The Protocol responds to this by providing a framework to identify, implement, measure and improve best practice in urban design. Although the agreement applies specifically to Australia’s capital cities, there is a recognition that regional cities and towns can benefit by sharing best practice knowledge and encouraging better quality planning and design of the built environment. Many jurisdictions already have in place guidelines and protocols relating to planning and urban design. Figure 1 illustrates a ‘line of sight’ from the National Urban Policy down to neighbourhood and street level. The Infrastructure Council of Australia’s Infrastructure Sustainability rating tool for infrastructure. Thinking about urban design, strategic and statutory planning at different scales helps put them in context. The elements of urban design are illustrated next to the scale of planning at which they are commonly addressed. Concept adopted from Next Generation Planning, published by the Council of Mayors (SEQ), 2011.